With the Operate Portal, you can use Stripe as a payment processor to collect payments from your Members. This guide will describe how to configure your Stripe card payments within Operate, and set up the Portal to accept ACH payments. 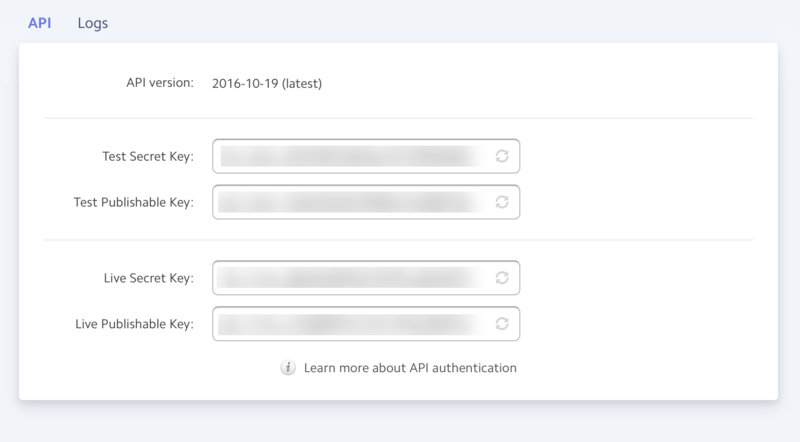 In order to use Stripe with Operate, you will need to register an account with Stripe. You can do this here. Each account comes with two sets of API keys: a live set and a test set. The test set should be used for testing purposes only. Requests sent through your test API keys will not reach the banking networks, therefore, please use the Live Key when you are ready to go live, to ensure your transactions go through. You can start using your keys as soon as your Stripe account is created. Before you begin testing, please create a test Account record within Operate and add yourself as a Contact under this Account. On the Contact record page, click the Email option and select your Portal Invitation email template. Email it to yourself then click the link you received to set your Portal Password. Next, copy the Test Secret Key. These keys unique to you and should not be made widely available, this is why the ones below are blurred out. Now go to Operate > Settings > General > Payment Processors and select the Organization which you are configuring. Click Configure to do so. Click Start, on the welcome screen. Enter your currency abbreviation, then paste your Test Secred Key from Stripe. This are allows you to either use live or test key versions, depending on which environment you want to use. Operate and Stripe will start working together to process transactions, but they will not be sent to the banking network if processed with View Test Data ON in Stripe and the Stripe Test Secret Key in Operate. You can now test transactions by making Portal payments, using a test Account. You can make a payment either by booking a meeting room or a desk, from under My Meetings; or by paying for a test invoice - please see Issuing an invoice and Paying for an invoice on the portal for further information. If your test goes well, you should be directed to a Stripe payment page where you can enter your payment details. The payment should be submitted without error and should be displayed under Invoicing > Accounts Receivable, in your test Account record. You can use one of the test card numbers listed by Stripe. Once you are satisfied with your testing, you are ready to allow Operate and Stripe to process live customer payments. You will notice that the process is very similar to the test setup. Next, copy the Live Secret Key. These keys unique to you and should not be made widely available, this is why the ones below are blurred out. Now go to Operate > Settings > General > Payment Processors > Stripe and select the Organization which you are configuring. Click Configure to do so. Enter your currency abbreviation, then paste your Live Secred Key from Stripe. Once this information is saved, your Stripe payments should now go live. In order for Stripe to be able to collect payments from Operate, the integration needs to be allowed to pass data between the two systems. 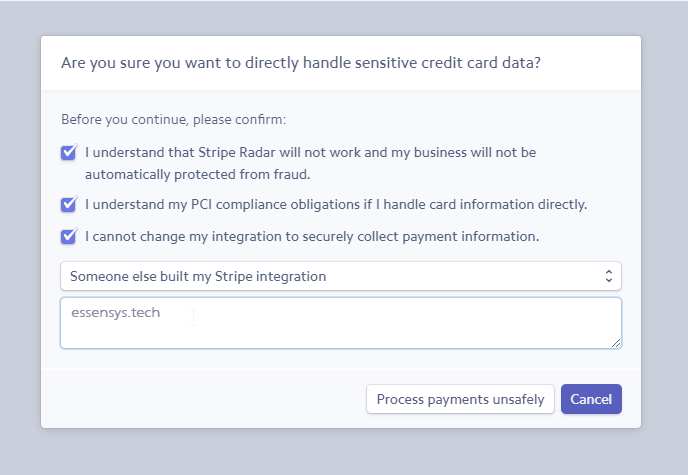 For this purpose, you will need to allow Stripe to 'process payments unsafely'. Please read more here. To do so, log into your Stripe dashboard and click on Business Settings on the left sidebar. Select Integration next, then use the toggle to switch on "Process payments unsafely". Stripe will then ask you a series of questions. Select each checkbox and then select "Someone else built my Stripe integration" from the drop-down. Enter "essensys.tech" as the vendor and then click the Process button. The steps below assume that you already have a Stripe account and that you have carried out the steps described above. ACH payments are only available for US Stripe accounts. 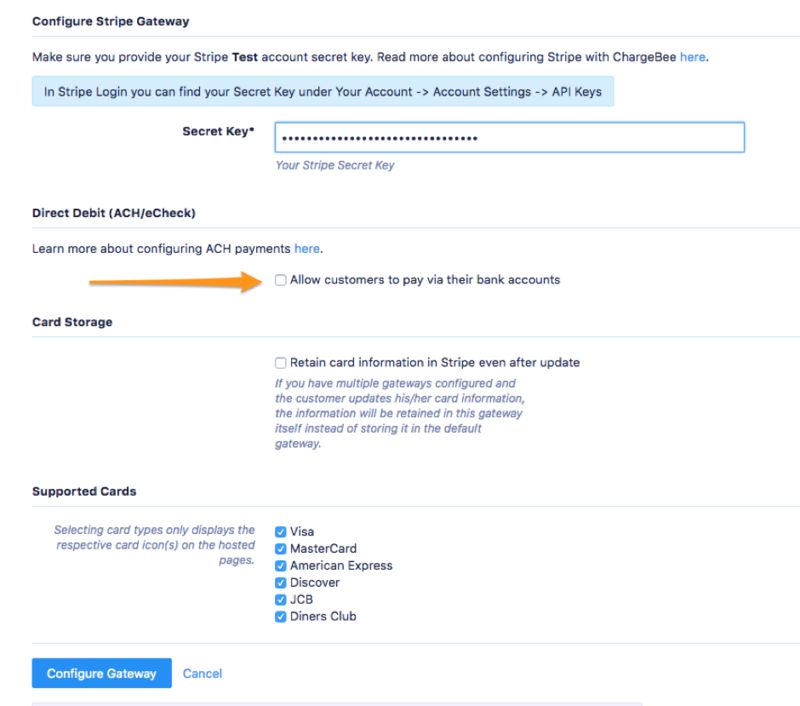 To enable ACH payments, navigate to your Stripe configuration page (Settings > Gateway settings > Stripe > Edit) and enable the Allow customer to pay via their bank accounts option. Clients can now make payments on your Portal using the steps in Paying by Stripe ACH.